Congress extends tax provisions for 2014 only. Congress cuts funding for the IRS. Expired tax provisions will make tax planning uncertain for 2015. Special offer for Real Estate Tax Handbook, 2014 Edition extended. Repair and capitalization rules make extended tax returns likely. Health care reform brings tax complexity. Have your employee health insurance plan reviewed. Business standard mileage rate increases. Financial Insider Weekly broadcast schedule change. 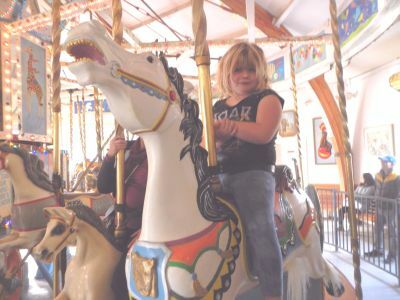 Kara Siemer on the carousel at Oak Meadow Park. Congress has passed and President Obama has approved on December 19, 2014 the Tax Increase Prevention Act of 2014. Many expired provisions, including bonus depreciation and the increased equipment expense limit were extended for 2014 only. We sent a separate email alert with some details. If you missed or misplaced the alert, call Dawn Siemer at 408-918-3162 or send her an email at dgsiemer@taxtrimmers.com and she'll resend it to you. In separate budget legislation, Congress has cut the budget for the IRS for the second year in a row. Although Congress may be seeking to "punish" the IRS for abuses relating to items like perceived abuse of tax exempt agencies that favor conservative causes, the IRS is the agency that keeps revenue flowing to government coffers. In addition, the IRS is facing a huge administrative challenge of implementing Health Care Reform. This was not a wise move. Since the tax extenders package only applied for 2014, the tax laws for 2015 are uncertain. This will make planning uncertain. There is also some talk of tax reform legislation, but it doesn't seem likely to me considering the Republican majority in Congress and President Obama's lame duck position. It's clear that President Obama will not approve the repeal of Health Care Reform, and I don't think Congress will try to do it anyway. We believe many of our readers missed our offer for the Real Estate Tax Handbook, 2014 Edition because of the holidays, so we are extending our offer. Some updates that are included are the new rules on repairs and capitalization, new rules for materials and supplies, federal estate planning changes, and the 3.8% net investment income tax. As an introductory offer, you can order a copy for $29.99, which is half price, plus $3.50 shipping and handling and, for California residents only, $2.93 sales tax. This offer expires January 31, 2015. According to the repair and capitalization regulations, change of accounting method forms should be submitted to the IRS for virtually every U.S. business and rental property. This huge paperwork job could bury tax return preparers and the IRS. When taxpayers get their medical insurance coverage using a state or federal exchange, they may qualify for a premium tax credit. It initially is applied as a subsidy to reduce medical insurance premiums. Virtually everyone who gets their medical insurance using an exchange is going to be required to complete Form 8962, Premium Tax Credit. This is a very complex form, and this requirement will probably lead many more low-income taxpayers to having their tax returns done by a paid tax return preparer. By the way, about half of the two days of tax update classes that I attended to prepare for tax season this year were devoted to Health Care Reform. All employers should have their employee health insurance plans reviewed. Virtually all employee health insurance should be provided through group health insurance plans. Employer reimbursement or payment of individual health insurance premiums is no longer permitted, and a big penalty can apply when employers have this kind of plan. I recommend that you consult with a qualified health insurance broker that specializes in group health plans about the status of the plan for your business. Effective January 1, 2015, large employers with 50 or more full time equivalent employees are required to provide medical benefit coverage for their employees. None of our clients are of this size. I recommend that large company employees should give attention to complying with these changes. The penalties for failing to comply can be onerous. The IRS has announced the standard mileage rate for 2015 increased to 57.5Â¢ per mile from 56Â¢ per mile for 2014. The standard mileage rate for medical and moving expenses decreased to 23Â¢ per mile for 2015 from 23.5Â¢ per mile for 2014. We are mailing instructions to our clients this week and next. If we prepared your tax returns last year and you haven't received instructions by January 20 or you would otherwise like to receive instructions, call Dawn Siemer at 408-918-3162. Most personal interview appointments for preparing 2014 individual income tax returns will be scheduled in February. Many clients send their information without having an interview, but if you need that personal attention, you should schedule your interview appointment now. Call Dawn Siemer Monday, Wednesday or Friday at 408-918-3162. Remember that most 2014 annual information returns, such as W-2s and 1099s, should be issued to payees by January 31 and sent to the tax authorities by March 2. Financial Insider Weekly broadcast schedule for San Mateo County. Financial Insider Weekly is broadcast in San Mateo County at 10:00 a.m. on Tuesday, Thursday, Saturday and Sunday on Comcast channel 26, Astound Channel 27 and AT&T U-Verse Channel 99.